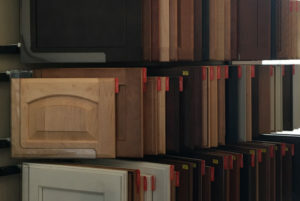 For your new kitchen or bathroom cabinetry, the basic options (style, wood type, etc.) can seem overwhelmingly endless. Add all the accents like moldings and finishes and you might find yourself endlessly overwhelmed. Fortunately, cabinetry pros can lead you down the right path of choices as they correspond to your plans. These choices go on, above or underneath cabinets as desired, some functional, some purely decorative. Stain – This is how to let the beauty of wood really (and literally) shine through, depending on the type of wood of which your cabinets are made. Not all wood is suitable for staining, though with wood of lesser grain a darker stain that can sometimes work. Distressed – No worries here as distressed cabinets are a popular treatment that can hide blemishes on wood of lesser grain. Plus, you can even create this look yourself if you have the right tools, approach and savvy. Paint – Obviously works for wood AND metal and is an especially good option for whatever surface you have. A big plus are the exception colors that can be utilized to really push your bathroom or kitchen’s overall look via painted cabinetry. Our designers are on hand to make sure your kitchen or bathroom cabinetry choices are exciting but not overwhelming.